The Inorganic Geochemistry team within the Centre for Environmental Geochemistry (CEG) has, with partners from Moi University and the University of Eldoret (UoE) recently completed another round of environmental and human biomonitoring sampling in West Kenya, ranging from the tea estates in Nandi Hills and Kericho, as well as the sugar cane belt across Kisumu County. This study started by joining research led by Dr Diana Menya at Moi University (CNN article) and Dr Valerie McCormack from the International Agency for Research on Cancer (IARC) are studying the high incidence of esophageal squamous cell cancer (ESCC) in the western part of Kenya including the Great Rift valley region. It is the 8th most common cancer by incidence worldwide and in Kenya it is the most common cancer in men and third most common in women. Initially the environmental survey was targeted at complementing a case-control study being conducted by Moi-IARC in several counties around Eldoret to provide a measure of environmental and dietary factors (see previous blog), alongside various causal factors that are now under investigation – consumption of a high ethanol traditional alcoholic brew, chang’aa or ‘kill me quick', cigarette smoking and hot tea drinking, but they are unlikely to fully explain the burden. Essentially, this project sets out to demonstrate the value of cross-disciplinary collaboration between epidemiologists, health practitioners, biostatisticians, geochemists, farmers and local agricultural extension workers. A great deal of interest was created amongst the communities who welcomed the research and could provide useful local knowledge with respect to farming and local health issues. Tea estates in Nandi Hills and 800m drop down from Nandi into Kisumu County - sugar belt. Over the past two years, with support from the BGS-ODA programme and CEG, the targets have widened to the collection of urine samples to provide a simple measure of population health status for micronutrients-MN’s essential to health (e.g. iodine, selenium) and potentially harmful elements-PHE’s (e.g. arsenic, chromium). Additional information is collected alongside drinking water, such as usage, reliability and source data that will supplement drinking water supply data from teams working across Africa led by Prof. Alan MacDonald – integration of datasets. Training has also been a key theme of the overall project, both for environmental/laboratory scientists from UoE and Public Health Officers (PHO) from each County Ministry of Health, to improve local capacity and build long-term partnerships to exploit funding opportunities. Overall, the quality assurance processes are repeatedly reinforced, from the point of planning sample collection, through collection of data and samples in the field, their preservation and maintaining the integrity of the sample until return to the laboratory at UoE or BGS for analyses. Ensuring a traceable audit trail from collection to reporting of data to enable reliable interpretation of data and reporting of data to local Ministry of Agriculture extension services and communication via PHO’s and joint publication in peer reviewed literature. Ultimately the training approach and transfer of surplus laboratory equipment from BGS and UK research partners will help in the teaching activities at UoE to develop local laboratory capability and systems to provide confidence in data output. Training in field activities has allowed us to scale up field collections cost effectively, but importantly forge strong partnerships. So what are we collecting? At each site we capture data on field sheets a range of data relating to the land-use, crops grown, drinking water source/usage and any local health problems (e.g. ESCC, goitre), along with soil, a panel of crops grown and eaten from the garden or farm, drinking water and a urine sample. The latter often results in some giggling, but nearly always enthusiastic participation, despite the potential embarrassment. We had three vehicles out in the field on predetermined routes to coordinate daily collections, often at difficult to reach places, but thankfully the weather held and many roads although difficult were passable. Of course, the entry point led by the PHO’s and often the drivers (they have a wider range of language skills) is invaluable in explaining what we are doing and why, in order to gain permission from participants at each site and can often result in a deluge of local information. In fact, we have rarely experienced a negative response, rather a great deal of interest and help. The challenge will be how we report data back in an appropriate format. Sampling in hard to reach places in Nandi hills where rapid changes from forest to farming taking place. The collection points rather than being led by the location of ESCC case-control sites has taken on a spatial link across each county, simply driven by spatial coverage where safe access is possible or where populations reside in the rural community (e.g. cannot access sugar cane estates, rainforest). In addition, we have incorporated into planning collection sites published soil chemistry parameters. Overall, data will be useful to agricultural extension officers to provide advice to farmers on soil management, to PHO’s in gaining datasets to estimate health status from a sample population within each county (e.g. micronutrient deficiencies, exposure to PHE’s). In the coming years, IARC-Moi University will use the environmental data/dietary intakes to support spot sampling for ESCC-control collection points, utilising the trained field personnel. From L-R: Collection of data; One of the field teams (includes Diana Menya). Data is already showing potential links through to developing other projects with UoE-Moi University, along the lines of pollution pathways, soil erosion (recent Global Challenge Research Fund (GCRF) bid), links through to Lake Victoria pollution and impact on fisheries/aquaculture. 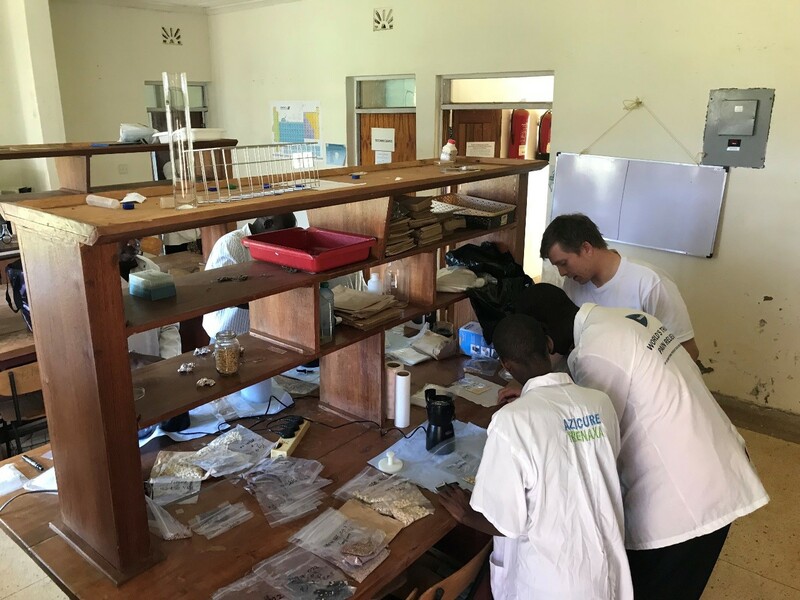 In fact, Andy Marriott stayed on in Kenya for another week to continue his Newton funded grant partnered with UoE, Kenya Marine and Fisheries Institute (KMFRI) and Ministry of Agriculture/Fisheries to sample fish, sediments and water whilst based on the KMFRI boat – blog to follow. Training in both directions has progressed, in that Olivier Humphrey (CEG/BGS University Funding Initiative (BUFI) PhD) joined the team for land-based sampling for a second time and very competently led one of the three field vehicles, collated all of the database information and provided training in the labs to UoE staff and a mix of 6 under-/postgraduate students – blog to follow. Tom Kelly also joined Andy on the KMFRI field boat for his first BGS overseas trip. Laboratory training at University of Eldoret. Efforts to develop project partnerships and two-way exchanges of staff and students has been recognised in that suggestions for an MOU have been discussed with the VC and DVC for Research and extension services at UoE. The coming months will see how we consolidate on the partnership and friendships built so far. I say friendships, because whilst we all recognise the value of what we are doing, the long days in the field on bumpy and dusty roads, plans not always surviving intact, the shared experience of tiredness and sometimes frustration is always backed up by lots of laughter - which is what you remember when leaving Africa. Dr Michael Watts is the Head of Inorganic Geochemistry at the Centre for Environmental Geochemistry at the British Geological Survey. Dr Diana Menya is a Senior Lecturer with the School of Public Health, Moi University, Kenya. Professor Odipo Osano is from the School of Environmental Sciences, University of Eldoret, Kenya. Public Health Officers Many thanks to the PHO’s from Kisumu, Kericho and Nandi Counties, some of whom were volunteer PHO’s serving their community and/or trainees building up work experience.